Cloning is the production of a complete organism or a part of a vital organism, based on genetic information (DNA) which was taken from an already existing organism. The method of cloning is rather a performance of “artificial twinning” which was applied on non-viable human embryos in 1993. They died at the latest six days later. “Actual” cloning would mean to take a cell from an adult individual, remove the nucleus and implant it in a fertilized egg that has had its nucleus removed. This has been done with frogs with a low success rate but certain scientists argue that they successfully cloned humans. There is no evidence for these claims (due to confidentiality) but at any rate, science is advancing quickly and if not yet, then human cloning might be possible in the near future. 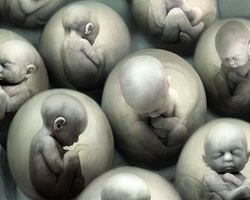 Although the majority of people agree that cloning is inhuman, the laws of cloning differentiate around the world. Cloning could bring about benefits in many medical areas such as cell development and various types of plastic and reconstructive surgery. Clones could be used as donors; to grow organs that exactly matched the recipient’s (the film “The Island” or “Never Let Me Go” suggest this). Infertile couples could have children. Cloning would have a much higher success rate than in-vitro fertilization. “Superhumans” could be ‘produced’ and used for various tasks. However, the whole way of cloning would be paved with unethical research. A clone would be a fully functioning human, an individual with an own character and intellect. I suppose that a clone would have many issues; it would ask itself whether it was actually “someone“, or merely an unimportant “copy”. A clone might be the ‘property’ of scientists or the government and might have to live for ‘it’s duty’ – for example, to donate organs. Would it have any human rights? Of course, some clones might “get” a normal life, for instance as the baby of infertile people. Nevertheless, it might never find out about its “origins” which would make its life, even if unknown, a lie. There are many roadblocks for cloning but in a time of endless advances, no one really knows what might happen next (in terms of cloning). The fact remains though, that cloning is throughout unethical and should, at least in my opinion, never be practised on human beings. Have Human Beings Been Cloned? Human cloning occurs naturally, it’s called identical twins. Such clones have exactly the same genetic information, but environmental factors mean that they definitely become different people. The same, I imagine, would happen with artificial cloning. Are the lives of IVF babies a lie if they find out their origins? If you think IVF is ok, and that twins are ok, is there any basis for opposing combining the two and having artificial human cloning? I’m not necessary saying cloning is right. I don’t much like the idea myself. But we have to ask ourselves where these feelings come from. Is it just a sort of superstition that makes us prefer ‘natural’ or ‘organic’ things when there is nothing really wrong with so-called ‘unnatural’ things. We have all sorts of artificial things – some people have artificial hearts. Should we be disturbed by that because they don’t have a real heart? As for e.g. people with artificial hearts – in my opinion, if they were about to die, they should have died. That’s the circle of life. Of course, I wouldn’t want any person I love to die, but we’ll have to face it at some point in our lives anyway. This entry was posted on 07/03/2011 by G in Academia, Favourite posts, Some Philosophical Rambling and tagged cloning, unethical.